OK, so this is a film that people will either love or hate. I loved it, and probably for the same reason that people will hate it. To begin, I saw this at an arthouse theater, and this is completely an arthouse film. It is far from a literal adaptation of Tolstoy’s work, and the creative liberties are huge. The film begins with our introduction to a stage, which ultimately becomes the backdrop for the remaining two hours. Director Joe Wright does an amazing thing with this, and I’m afraid it won’t translate well into words. The stage is not a separate entity from the world. The characters move across it as they would a room in the house, using it to enter and exit scenes, all in a seamless transition that obscures reality with the abstract. 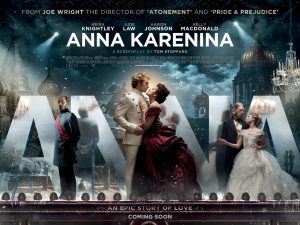 As soon as we realize the intriguing presentation we are experiencing, we come to understand that this is not necessarily the Anna Karenina many have read, but is actually a new work of art which incorporates Tolstoy’s work as a central piece of its performance. This deserves your time to go and see it. 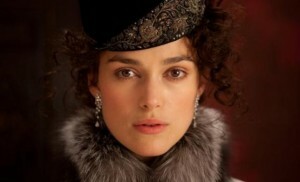 It is an experience the likes of which we rarely see in the cinema. This was a total win in my book, but again, take caution, THIS IS AN ARTHOUSE FILM, and is not at all the image most people had in their minds as they read the novel. This film is a creation of its own. To be appreciated, it must be seen almost independently from its source material. If you can do that, then please, prepare for something new. This entry was posted on Thursday, November 15th, 2012 at 6:41 pm	and is filed under Film, News. You can follow any responses to this entry through the RSS 2.0 feed. You can skip to the end and leave a response. Pinging is currently not allowed. « ‘American Horror Story’ Renewed For Third Season!!! Is everything a joke to you, Gordon? Only the things that matter.